Last year, President Barack Obama's State of the Union address was met with a seemingly unending stream of unofficial Republican responses that only served to dilute the message of the party's official rebuttal. It seemed as if everyone in the party — from potential Republican presidential candidates to freshman senators — had something to say, fueling criticisms the party severely lacked cohesion. With the presidential election slated for later this year (and let's be real, a presidential primary ballot that lists Donald Trump), it's likely we'll see another tsunami of unofficial SOTU rebuttals from the GOP. Consider this your guide to getting ahead of the SOTU response wave. According to the rules — by which I mean, the U.S. Constitution — the only hard and fast rule is that the president must "from time to time give to the Congress information of the State of the Union." However, an unofficial standard has been established by presidents over the years because, as anyone who's ever attempted to play an SOTU drinking game without first establishing some guidelines can tell you, rules are often a necessary evil. While the first SOTU message was given by George Washington in 1790 (then known as the "the president's annual message"), Thomas Jefferson reverted to a written message in 1801. It was Woodrow Wilson who, in 1913, re-established the practice of presidents giving in-person SOTU speeches before Congress. The SOTU has since turned into a much-hyped television event, although last year's record-low ratings are evidence the political dog and pony show may be losing its "must see" quality. In recent years, Obama has broken slightly with tradition by previewing his SOTU in the days ahead of the speech. What's all this I hear about a rebuttal? Nowadays, the opposition party is allocated one official response to the president's SOTU, a practice that only began five decades ago in 1966. The response is televised immediately following the president's address. South Carolina Gov. Nikki Haley has been chosen this year to give the official Republican response to Obama's SOTU next Tuesday. Traditionally, no other response offered up by Republican politicians, save for a Spanish-language version of the official rebuttal, can be defined as the party's formal line. This is not likely to keep a slew of Republican politicians — especially those running for president — from adding their 2 cents to the conversation. Last year's SOTU saw unofficial responses given in recorded video by presidential hopefuls Sen. Rand Paul and Sen. Ted Cruz, along with Facebook rebuttals from Jeb Bush and then-presidential hopeful Mitt Romney. Former Arkansas Gov. Mike Huckabee offered up a 120-character SOTU rebuttal on Twitter, as did Louisiana Gov. Bobby Jindal and Congressman Steve King. 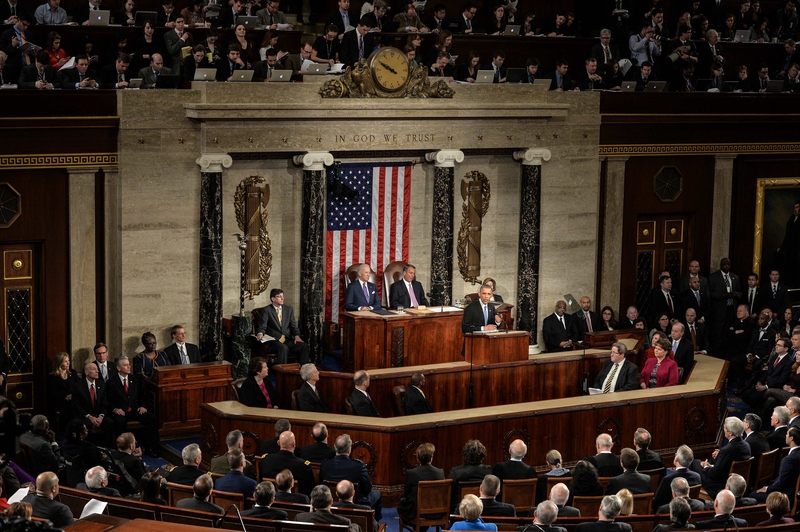 Pre-SOTU rebuttals were released by then-Speaker of the House John Boehner, Colorado Sen. Cory Gardner and Tennessee Sen. Lamar Alexander while the tea party had Congressman Curt Clawson give their party's unofficial "official" rebuttal. So, who should I look for a rebuttal from this year? Just as they did last year, most of the 2016 Republican presidential candidates are likely to publish some kind of response to the president's SOTU address if only to capitalize on a golden opportunity to push their own platforms and agenda as we move closer to the Iowa caucus. Perhaps the most anticipated rebuttal (if only for its inflammatory soundbites) will come from Donald Trump, whose poll numbers show him ahead of the pack in the Republican presidential primary. Trump will appear on The Tonight Show With Jimmy Fallon on Jan. 11, a day ahead of Obama's SOTU, giving him ample airtime to talk. The majority of the 2016 candidates have so far refrained from commenting on their plans to react or respond publicly to Obama's last SOTU. Cruz, however, told NBC's Andrea Mitchell he planned to provide a response, but would not be attending the SOTU due to campaign conflicts in New Hampshire. "It's not meant as disrespect," Cruz said, according to a tweet Mitchell published Tuesday. Why does it matter if other Republicans serve up millions of unofficial responses? The torrent of unofficial reactions from Republican politicians last year took substantial media attention away from the party's official response while also serving to confuse and dilute the message put forth in Iowa Sen. Joni Ernst's speech. For many, the five in-depth responses (Ernst's official speech, Florida Rep. Carlos Curbelo's Spanish-language response, the tea party's response, and Paul and Cruz's taped messages) was a clear sign in-fighting had weakened the party, TIME reported at the time. While SOTU reactions might help voters determine where 2016 candidates stand on vital issues like gun control, climate change, Guantanamo Bay, healthcare reform, and terrorism, the flood will pull attention and debate from whatever message Haley puts forth in the GOP's official rebuttal. The greater the number of responses from Republican politicians, the higher the chance GOP members will step on each other's toes by contradicting one another in touting the party's line. There's nothing worse than a crowded dance floor.